As our large yellow school bus pulled up to Pleasant Bay in Orleans, MA, the several dozen Harvard Extension School students and their guests, peered through the windows at the scant beach that had appeared between two homes along the road. The short staircase leading down from the road and the short beach reminded me more of a lake or a pond than the “beach” that I had grown up with. As we stepped down from the bus, that notion was quickly laid to rest. While the horizon kissed land not sea, the salt in the stiff yet lofty breeze carried the scent of the beach from my childhood. From the text, Marine Biology: an Ecological Approach and lecture by George Buckley, I knew that both my eyes and my nose were partially correct. Largely protected from the full force of the barrier beach break by the fingers of the Cape, controlled amounts of salt water flowed into the bay mingling with freshwater transported from bogs and swamps through a network of tributaries. Pleasant Bay is an example of coastal plain estuary, formed by patterns of advancing and retreating of glacial ice. As we stood on the narrow beach, huddling in close to the professor as to catch his words before they sailed away on the breeze, the gentle tide painted a micro-portrait of how this might have occurred. Shortly before we prepared to climb back up the stairs and onto the bus, we turned to find that not 30 yards to the north of us, the beach had grown a sandy arm emerging from the water in a delicate relief. The sand carried back and forth by the tide had deposited unevenly creating a slight sand bar just offshore. Seeing this formation taking place in in such a short span of time beautifully illustrated how ephemeral all of our marine environments truly are as each grain of sand is subject to the whims of tidal flow. Although we visited several marine environments on this excursion, I was most intrigued by Pleasant Bay. This environment was quite distinct from what I envisioned as a beach. What appeared to be nothing more than a scruffy shoreline at first glance, emerged as an environment rich with life. Both the thunderous waves of Nauset Beach and the majestic expanse of Rock Harbor beckoned to my childish impulses to frolic in the sand and sea: yet it was our brief visit to Pleasant Bay that helped me to broaden my lens of the sea. It was there that I met limulus polyphemus, and learned the true story of the horseshoe crab that had terrified me as a child. Likewise, it was once that scruffy little beach that I learned that the scraps of brown seaweed that I had felt crunch under my toes on hot summer days was possibly still alive. I was struck by the cycles of life that were illustrated within the bay; the nursery and breeding ground for horseshoe crabs and countless other organisms; the planarians, or flat worms that can thrive in communities of up to 1000 individuals atop an unsuspecting horseshoe crab; and the algae and grasses that traversed tributaries from the marshes into the bay, providing nutrients for the budding life within the bay. The intricacy of evolutionary logic found within this ecosystem is both mesmerizing and humbling. Delving into the history of human misconceptions of this environment proved to be far more humbling. It seems that I am not the only one that was once afraid of the horseshoe crab. I, as a little girl, was frightened by the “militant” shell, pointed tail and decidedly un-cuddly legs. Grown adults it appears have succumbed to the fear of the “dangerous” horseshoe crab, as well. Out of fear that the horseshoe crab can destroy entire crops of commercial shellfish, fishermen killed as many as possible. Bounties were placed on their heads and fishermen invented ways to utilize their meat as fertilizer and bait. Indeed, I remember stumbling across a large female on a family outing to the beach, and watching my uncle spear her with a large stick while proclaiming that he was doing it for the good of the larger ecosystem. All of us, it seems, countless fishermen, my uncle and myself, have all been fooled an urban legend and in a sense by evolution itself. While limulus’s helmet like shell gives the impression of a militant crab trolling the sea and shore for unsuspecting beds of shellfish to pillage, this impression is merely the product of an evolutionary design to deter predators looking for an easy meal. Not a crab at all, limulus polyphemus is actually most closely related to the spider family. Its menacing helmet and tail are actual a three sectioned shell attached by hinge joints. The two large sections of the main shell make up the carapace. The blade like tail, often mistaken for a weapon, is in reality used as a rudder and for leverage when turning over in the sand. Beneath the carapace, five brown legs reminiscent of a large cockroach surround the mouth. At first glance, the forked and feather tips of each leg appear to be clawed. On closer examination, the legs begin to resemble brown seaweed rather than claws. The forked shape of the first four pairs of legs assists in walking, while the hind pair of legs is feathered for added traction when pushing off of the sand. While the male does have two hooked claws, these are for neither predation nor defense, but to aid in reproduction. Aside from these numerous discriminatory assumptions made based on a limited understanding of the limulus’s body structure, conceptions about the supposedly “genocidal” diet also have proved false. 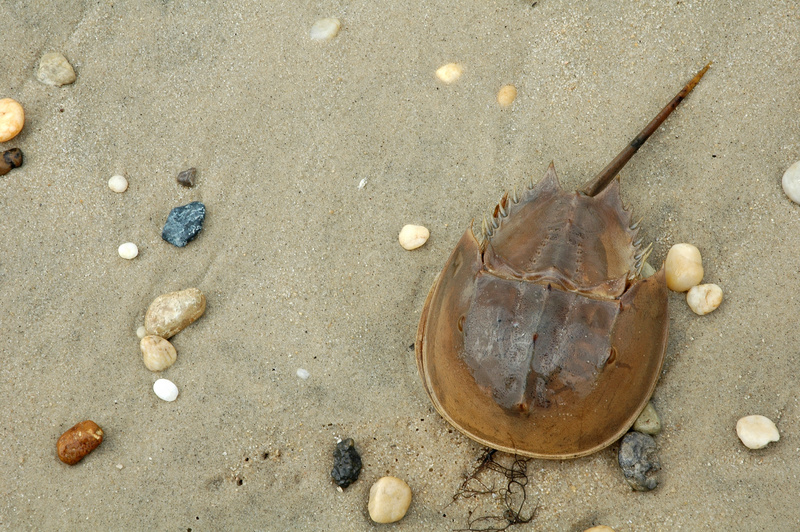 Analysis of stomach contents and feeding patterns of hundreds of horseshoe crabs concludes that the limulus in actuality eats a diverse diet while playing a vital role in the predator prey cycles of the bay. Even more intriguing the discovery that limulus is not a menace after all, is the discovery of limulus’s invaluable contribution to science and medicine. Promising properties have emerged through in depth study of the blood of limulus at Wood’s Hole’s Oceanographic Institute. When first extracted from the venous sinus at the joint of the two sections that make up the helmet like shell, the blood appears a grayish white color due to copper found in the blood stream. When oxygen is introduced to the blood, it turns blue. This blue blood is able to clot very rapidly and will do so within minutes. Scientists have been able to extract a clotting agent to aid in medical procedures. Harvested blood has proved useful for testing biological cleanliness as it will froth and react with any bacteria or organic contaminants. This discovery is bringing about a shift in perception of the horseshoe crab as a nuisance species to a generator of revenue. While these have been valuable studies for medical communities, in the long run, they just might hold the key to preserving horseshoe crab populations. The “book” gills located on either side of the hind pair of legs enable the horseshoe crab to stay out of water for long periods of time without incurring physical damage, assuming that no sand invades the seal created as the gills fold shut. This enables adequate time for harvesters to draw blood and return the animal to sea before respiratory cycles have been compromised. The same clotting agent that attracts the medial world to the limulus ensures that the extraction of blood via a hypodermic needle will seal over and heal quite rapidly. Provided that harvesters are educated about proper revival techniques post extraction, the harvesting of their blood will bring no harm to the invaluable limulus population. In fact, these discoveries will boost populations because they have enabled a shift in perceptions reducing if not eliminating the dangers of human predators. Much as my first impressions of the horseshoe crab were filled with fear and a certain level of distaste, I found that I had misconceptions of other marine life I had encountered in my childhood. Seaweed to me had always meant the foul aroma emanating from my macrobiotic neighbor’s apartment and the slimy, lacy “plant” that made my toes curl while wading along the shoreline. On the beach of Pleasant Bay, I learned that much of what I understood about seaweeds was inaccurate as well. Those slimy organisms between my toes were hardly plants, although they are referred to as plant-like organisms. These seaweeds are actually intertidal algae. They do not have chloroplasts, leaves or guard cells that are characteristic of plant life. The lacy structure that resembles leaves is actually a network of blades and swim bladders to enable the seaweed to float nearer the surface gaining increased access to sunlight. Although seaweed’s stipe resembles the stem of a plant, it is not used to transport energy throughout the organism. The hold fast of seaweed is similar to a root, however does not spread out like plant root structures. The complexity of intertidal algae is further illustrated by its adaptability. To survive within estuaries, these plant-like organisms must be able to maintain fluctuations in both salinity and temperature, as varying amounts of salt and fresh water merge and mingle together. This requires a robust biological structure that differs from non intertidal algae. At Pleasant Bay, I was able to test another feature of this seaweeds hardiness first hand. Buckley had informed us that the seaweed was capable of surviving what appeared to be complete dry out due to the presence of glycosides. Skeptical, I scoped the beach for a dry and brittle clump of seaweed, what I believe to be rockweed; a species of the genus fucus. The seaweed was so stiff between my fingers that it seemed as if it would crumble in my hands. Falling behind the group that was now heading back up to the school bus in search of lunch, I brought the dry seaweed to the water’s edge. Kneeling down, I submerged it below the frigid water and waited. Sure enough, in the time it took the first half of the class to re-board the bus, flexibility returned to the stipe and a slimy texture returned to the surface of the seaweed. It was as if this organism had been reborn in my hands. I released the seaweed back into the bay and dashed up to the bus. Having glimpsed the intricacy of just two organisms that reside in Pleasant Bay, I gained a deeper appreciation for the structure and behavior of organisms of the sea. The “Cinderella Story” of the horseshoe crab provides a window into the effects that human misconceptions and behaviors can have on marine life as well as the benefits that marine life can hold for medical science. Each and every organism, from the smallest shrimp larvae to humans ourselves, is deeply interconnected as we share one planet. The ocean provides a bounty of food, recreation and scientific discovery. Unfortunately, we all too often respond with offerings of trash, pollution and overuse. In New England, seasonal weather patterns place the largest strain of use in a 100 day period in the summer months. Beaches, bays and marshes are quickly overrun with beachcombers, sunbathers, sailors and countless other recreation seekers. If we to continue such activities, serious questions must be answered about how to ensure that our recreational use of these environments can be sustained over decades of summers to come. Most individuals that relish in the heat of the summer months at the water’s edge do not do so with the intent of damaging the ecosystem. In fact, much of the damage that occurs during this time is due to absentmindedness and an ignorance of the needs of the beach. By educating the public about conscientious beach use, much of these areas can be preserved. Regulations regarding the protection of sand dunes and beach and marsh grasses can go a long way to preserving the integrity of the beach. Regulations alone can only go so far however. In order for them to be followed appropriately, the public must be informed and methods of enforcement must be considered. Pictorial signs placed near the dunes can inform beachgoer, adults and children alike, of requirements to stay off of the dunes and to leash dogs so they cannot disturb the dunes’ structural integrity. Signs near bath houses, showers, and sandwich shops can explain the reasoning behind such restrictions and instructions for refilling holes that are inadvertently made on a dune. While foot traffic on the beach was once the largest concern for these environments, the explosion within the past several decades of new water sports and recreational activities pose additional strains on the ecosystem. Shorelines that once were divided up by swimmers and boaters now must be shared by windsurfers, stunt kite flyers, Para-sailors, water-skiers and countless others. Many of these activities involve motor boats and take up more and more space in the water. As shorelines are dotted more and more heavily with boats, the risk of injury and accident climbs steadily higher. Overcrowding of high speed water vehicles pose the threat of increased crashes that can result in injury to participants as well as fuel leakage into the water. With a limited timeframe for all of these activities to take place simultaneously, regulations must be imposed to ensure the safety of boaters, beachgoers and the ecosystem. Calendars should be created dictating allocated time periods for various recreational uses. The structure could be modeled after the restrictions imposed on hunting seasons in forest environments. While there is always reluctance from the public when restrictions are imposed on any activity, through education and careful enforcement of regulations, they will gradually be accepted not only as commonplace, but as our duty as responsible patrons of the sea. I do not think that I understood this notion of a patron of the sea myself until the education that I received on the beach that day windy day in Orleans. I have always loved the ocean: scouring for seashells, wading, water-skiing and windsurfing. In that sense I have appreciated the beach for the recreational enjoyment that I have been able to derive from it. Buckley has shown me the intricate ecosystem that makes such activities possible. He has helped me to understand that my enjoyment does take a toll on this ecosystem and that there are responsible ways of reducing this toll. I have glimpsed the source of the excitement behind all of Buckley’s lectures and have found my own thirst for a deeper understanding of the intricate complexities of the ecosystem. I have discovered for myself that the rewards of an ecological understanding are greater than the thrill of an A on any essay or test, because it enhances an understanding of the nature of life on this planet and our future as a profoundly influential species.